Carnosine dosage is not standardised. 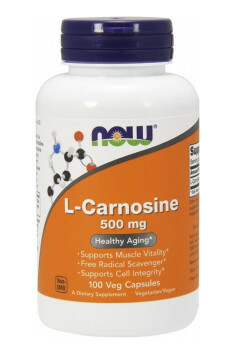 Carnosine is degenerated quickly in the body by the enzyme carnosinase. It is assumed that the daily dosage of 1000 mg can overcome the effects of carnosinase, leaving in the body enough carnosine for therapeutic purposes. The recommended dosage of 1000 mg should be divided into two doses (500 mg each) – one taken in the morning and the second one in the afternoon. Carnosine dissolves in water, but it is suggested to take it during a meal for better absorption. Carnosine is believed to be a very safe, non-toxic and well-tolerated substance. It has a light stimulant effect on some individuals and should not be thus taken in the late evening in order to avoid the disruption of natural sleep patterns.